The divide between urban and rural America seems to be growing, but U.S. Secretary of Agriculture Sonny Perdue sees an opportunity to bridge that divide, with counties’ help. Like residents of many rural counties, he sees that bridge to be broadband internet access, and he sees himself as a proponent in the Trump administration for a “moonshot” effort to get ubiquitous broadband access across America. 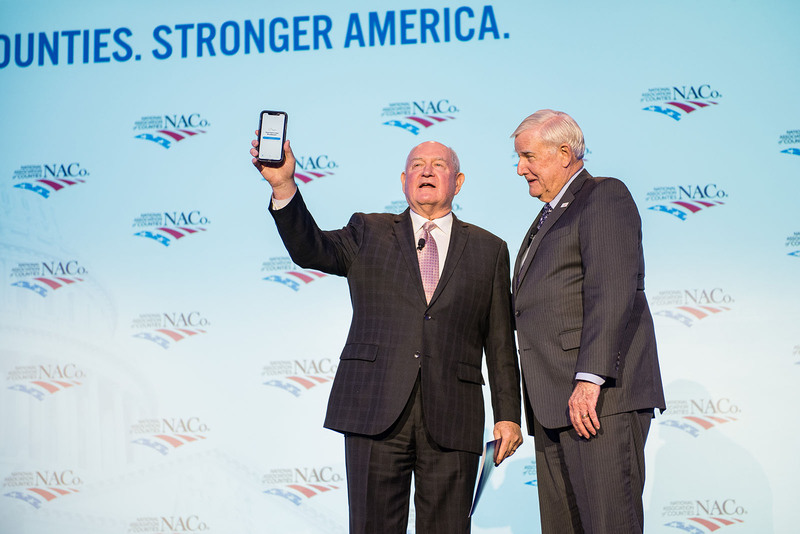 While speaking to the General Session March 5, he encouraged county officials to spread the use of NACo’s TestIt app, which evaluates the strength of internet connectivity and sends it to a central map, to help give NACo and USDA tangible numbers with which to work as the government seeks to spread broadband internet access. “These data maps we have basically from the incumbent carriers I don’t think are quite accurate,” he said. “I think you all can be very, very helpful with the data nationwide to report in. He also promoted USDA’s ReConnect program, which is offering $600 million evenly divided among grants, loans and loan-grants combinations to help build rural broadband infrastructure. Grant applications are due April 29, loan and grant combination applications are due May 29 and low-interest loan applications are due June 28. He sees a lot of common mission and customers with the Small Business Administration and other executive departments, including Housing and Urban Development, particularly as some rural counties transition to become suburban and urban areas. Underlying all of those efforts, though, is a strong connection among the federal, state and local levels, which Perdue thinks, particularly after inviting county elected officials to the White House, the Trump administration is building. “We want to be on your side, our building doesn’t get bigger or better without a strong foundation,” he said. Perdue reflected on his own service in county government, as a Houston County, Ga. Planning & Zoning Commission member in the 1980s. He also remarked that he only worked in an advisory role for the county, and that the big decisions were left to the elected officials.